Devotee: A book called Advaita Prakasa was recently translated from Bengali into English. I was very inspired by it and it seemed to be bona-fide, but I recently heard that it is an unauthorized literature. Can you explain? Answer: Advaita Prakasa is a hagiography of Sri Advaita Acarya Prabhu which was written around 1560 and it is claimed that its authorwas Sri Isana Nagara, the servant of Advaita Acarya. However, considering the historical and philosophical inaccuracies in the book it cannot be considered bona-fide. The pervading mood throughout the book is that Advaita Acarya holds a much higher ontological position than that of Sri Caitanya Mahaprabhu since it was He that invoked the Lord and later requested the Lord to leave. In other words, in Advaita Prakasa Mahaprabhu is treated simply as a functionary Deity, to be summoned and dismissed at will. It is also implied in Advaita Prakasa that the main branch of the Caitanya-tree is the seminal line of Advaita Acarya, advaita-vamsa. "Advaita Prabhu married in the beginning of the fifteenth century Sakabda (late fifteenth century A.D.). When Lord Caitanya Mahaprabhu wanted to visit the village of Ramakeli while going from Jagannatha Puri to Vrndavana during the Sakabda years 1433 and 1434 (A.D. 1511 and 1512), Acyutananda was only five years old. The Caitanya-bhagavata, Antya-khanda, Fourth Chapter, describes Acyutananda at that time as panca-varsa vayasa madhura digambara, "only five years old and standing naked." Therefore it is to be concluded that Acyutananda was born sometime in the year 1428 (A.D. 1506). Before the birth of Acyutananda, Advaita Prabhu's wife, Sitadevi, came to see Lord Caitanya Mahaprabhu at His birth. Thus it is not impossible that she had the other three sons by Advaita within the twenty-one years between 1407 and 1428 Sakabda (A.D. 1486 and 1507). In an unauthorized book of the name Sitadvaita-carita, published in Bengali in the unauthorized newspaper Nityananda-dayini in 1792 Sakabda (A.D. 1870), it is mentioned that Acyutananda was a class friend of Sri Caitanya Mahaprabhu. According to Caitanya-bhagavata, this statement is not at all valid. When Caitanya Mahaprabhu accepted the renounced order of sannyasa in the year 1431 Sakabda (A.D. 1509), He came to the house of Advaita Prabhu at Santipura. At that time, as stated in the Caitanya-bhagavata, Antya-khanda, Chapter One, Acyutananda was only three years old. The Caitanya-bhagavata further states that the naked child, the son of Advaita Prabhu, immediately came and fell down at the lotus feet of Lord Sri Caitanya Mahaprabhu." So, if indeed Sri Isana Nagara was the actual author of Advaita Prakasa, it is most illogical that as Advaita's family servant that the age of his master's son would not be known to him or that he would make such a mistake as to think that Acyutananda could have been Mahaprabhu's student when in fact Acyutananda had not yet been born. prakasananda namaka ekajana kaivalyadvaitavadi adhyapaka-yati veder vyakhya-kale amara aprakrta nitya anga-samuhake vi khandita kare. Ei prakasanandake keha keha anabhijnata-vase kaveri-pravasi vyenkata bhattara anuja prabodhanander sahita samajnana kare. Bhaktamala namaka sahajiya-granthabhyastare ei prakara bhrama-dosa pravesa karaya, adhunatana lekhaka-ganer madhye u sei bhrama-dosa nuyanyadhika pravesa kariyachhe. "Prakasananda was the name of a scholastic sannyasi of the Kevala-advaita school of philosophy and through his explanations on the Vedas, he would cut the Lord's transcendental body into pieces. Some ignorant people consider that this Prakasananda is the same person as Vyenkata Bhatta's younger brother, Prabodhananda, who lived on the banks of the River Kaveri. This mistaken belief is found in the Sahajiya book Bhakta-mala, and even in the works of many modern day scholars." (Caitanya-bhagavata, purport to Madhya-khanda, 3.37). That Srila Prabodhananda Sarasvati was a tridandi-sannyasi originally in the line of the sampradaya of Acarya Ramanuja is a topic that may warrant a separate article. However, it is sufficient to say here that those in the line of Srila Bhaktisiddhanta Sarasvati Thakura do not entertain the idea that Prabodhananda was formerly the Mayavadi sannyasi known as Prakasananda, as stated in Advaita Prakasa. Furthermore, in chapter ten of Advaita Prakasa, we find an incident wherein baby Nimai refuses Saci-devi's breast milk because she has not taken diksa from Sri Advaita Acarya. In order to please her child she then takes initiation from Advaita. However, nowhere in the bona-fide biographies of Sri Caitanya Mahaprabhu do we find any mention of Saci-mata taking initiation from Advaita Prabhu. This is merely a fabrication created by the seminal gosvamis of the Advaita-vamsa to show the importance of Advaita Acarya over that of Sri Caitanya Mahaprabhu. In chapter twelve, Advaita instructs his son not to chant 'om gauraya namah' in worshipping the Deity of Gaurasundara, but rather to chant 'om krsnaya namah'. Similarly, in chapter twenty, Gauridasa Pandita and Acyutananda approach Sri Advaita Prabhu and request him to tell them which mantra to use in the worship of Sri Caitanya Mahaprabhu. Advaita Acarya replies, "I don't know whether you know, but Lord Krsna Himself has descended in Nadia. He has covered His body with the bodily complexion of Srimati Radharani, just as a person appears different by wearing different dresses. Therefore Mahaprabhu is worshiped by meditating on the ten-syllable Gopala mantra. Worship Radha as the covering of Krsna, and then your worship will undoubtedly be successful. By worshiping Nityananda through the Narayana mantra, your worship will be successful and you will be happy." Advaita Prakasa also advises that one should worship Srimati Radharani separately as the 'covering' of Krsna, and that Lord Nityananda should be worshipped by the Narayana mantra (om namo narayana). However, this system of worship has not been mentioned in any of the bona-fide arcana-paddhatis of the Gaudiya sampradaya. "There are several other new books or books that were written a little later (such as Jayananda's Caitanya-mangala, Govinda Dasa's kadaca, Vamsi-siksa, Advaita Prakasa, and Nityananda-vamsa-vistara). Although it is said that these books are old, we have no interest in them. They are distinct in the way that they are incorrect in their philosophical truths and conclusions. Their narrow-minded, evil intentions are obvious and highly noticeable due to the absence of any effort and proper teachings in them. 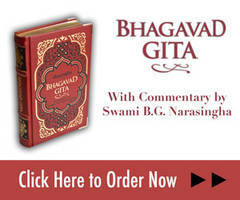 The Caitanya-caritamrta is said to be the original book and these apa-granthas (bogus books) are not recognized." Nowadays, some devotees are known to use little or no discretion in reading or in publishing various books without fully being aware of their origins or contents. It is not a good sign when devotees are translating and publishing literatures whose contents clearly contradict the bona fide Gaudiya-siddhanta and which have been rejected by our previous acaryas. Some persons, in the name of presenting the Vaisnava community with new and 'nectarian' literatures, are unwittingly administering apasiddhanta (poison). By digesting such poison, the innocent devotee becomes prone to accepting more and more apa-siddhanta as the real conclusions of the previous acaryas Ð such acceptance of apa-siddhanta cripples the spiritual advancement of an aspiring devotee. The unauthorized tendency to read many books does not only pertain to reading so-called devotional literature. Such books also include books on the lives of famous Sahajiya and Mayavadi gurus, Christian mysticism, Tantra, UFOs, mundane novels, Tibetan Buddhist meditation techniques and the prophecies of Nostradamus to name but a few. Such mundane books are known as asat-sastresu and fall under the category of prajalpa since they are full of topics unrelated to pure devotional service. Such books are useless for our advancement in Krsna consciousness. The great Vaishnava saint Sri Madhvacarya has advised that one who is serious about attaining the lotus feet of Lord Hari should become callous towards such worthless books (na codasinah sastrani). To read many books, for whatever the reason, can be the cause of ruination for a sadhaka if it is done without the guidance of a senior Vaisnava. Srila Sridhara Deva Gosvami Maharaja has commented that even the reading of the Bhagavatam without the permission of a senior devotee cannot be considered as pure devotional service. We may attain some knowledge by such study, but we will not attain bhakti. Reading on our own initiative is only knowledge-seeking which does not promote pure devotion, suddha-bhakti. The bewildered mind may dictate to us that by reading many books (such as Advaita Prakasa) that we will obtain a greater understanding of the Supreme Lord or that we will obtain a greater knowledge of the scriptures, but this is doubtful. Unfortunately, by studying unauthorized books or even by hearing too many opinions one runs the risk of spoiling his advancement in Krsna consciousness. One should therefore not read, translate, or publish those books that are not recommended by Sri Guru and the previous acaryas.